studioinges was established in 2004 and is conducted by the three partners Thomas Bochmann, Francesca Saetti and Stefan Schwirtz. The Berlin-based office for architecture and urban planning has recently won the german DEUBAU-award 2012 for young architects. Their versatile practice includes projects ranging from large-scale urban projects to public buildings and commissions for interior works. 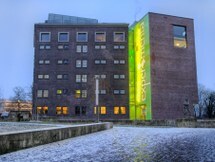 The experimenta Science Center Heilbronn is their best known project and has been awarded several times.